Today I thought I would show you my stamping space. 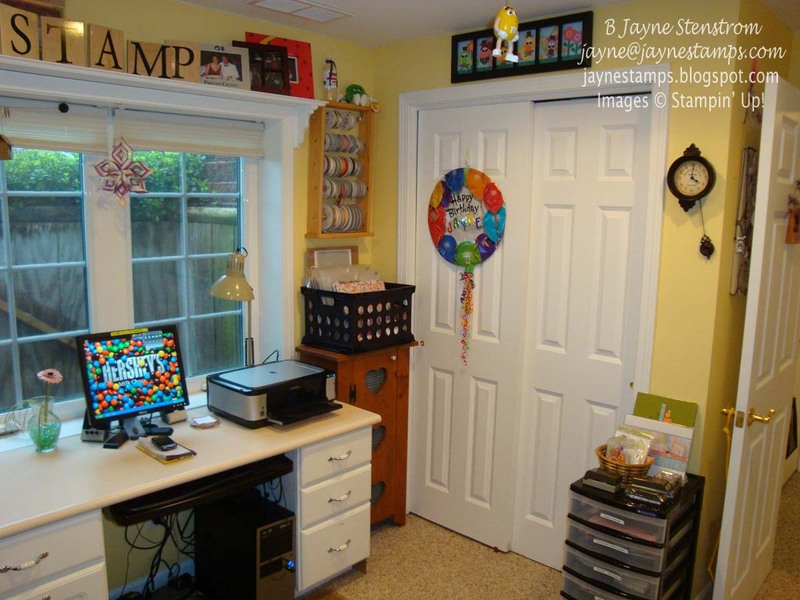 When we first moved into this house almost 10 years ago, my stamping space was a room on the main floor that was actually designed to be an office/den. 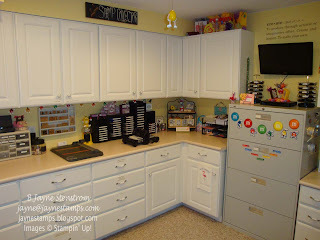 The only "counter top" space I had was a computer desk and pretty much all of my supplies were in those 6-drawer plastic drawers on wheels. 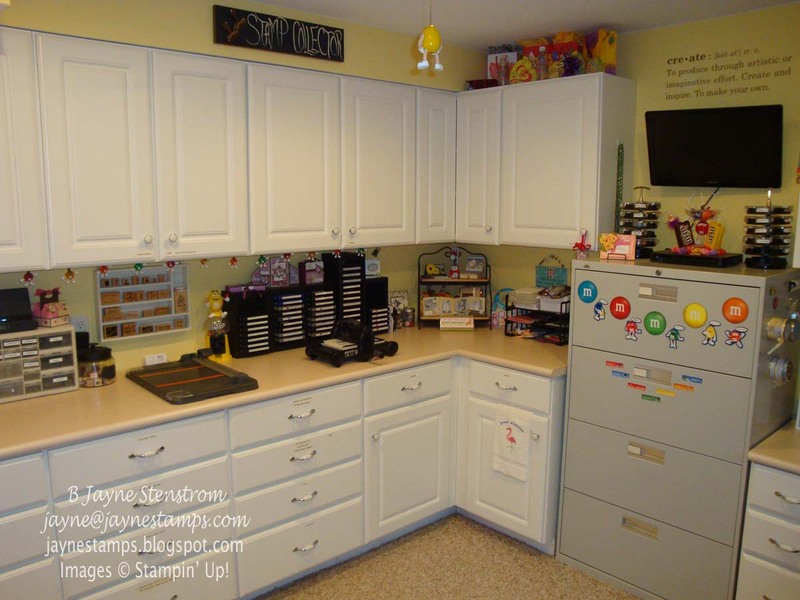 I even had doubled up on the drawers by stacking one on top of the other to get more storage space! The other drawback to that room was it got HOT in there. There's a large window that faces east and when the sun came up in the morning, it got that room cooking! It was always about 10 degrees warmer in that room than in the rest of the house. I know, I know. I'm VERY fortunate. Now, don't drool all over and get my carpeting wet! I took the first picture looking in from the door and then I turned to the left and took pictures around the room. Last picture. 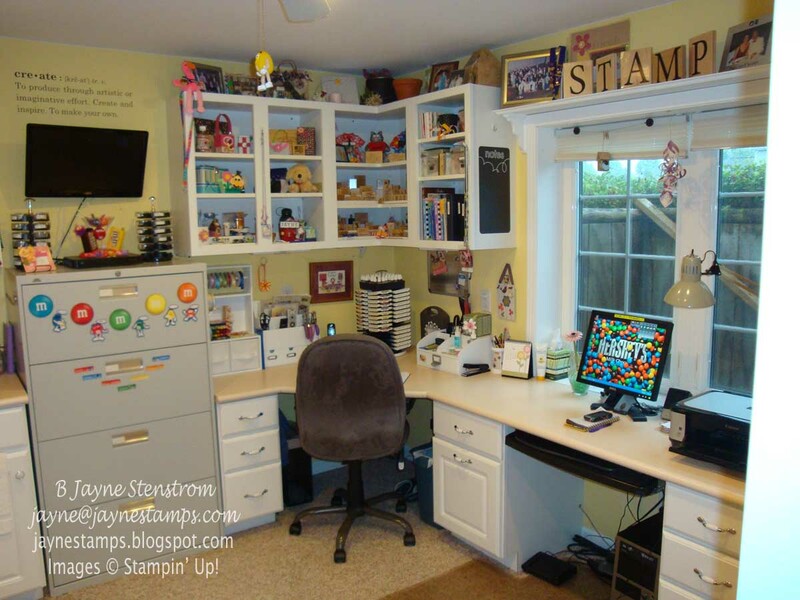 Behind those closet doors lies my collection of stamps. Why didn't I show you that, you ask? Hey, I'm no dummy! Some things (like the size of my stamp collection) should be kept under wraps. But if you come over to my house sometime, I'll be happy to let you have a look! 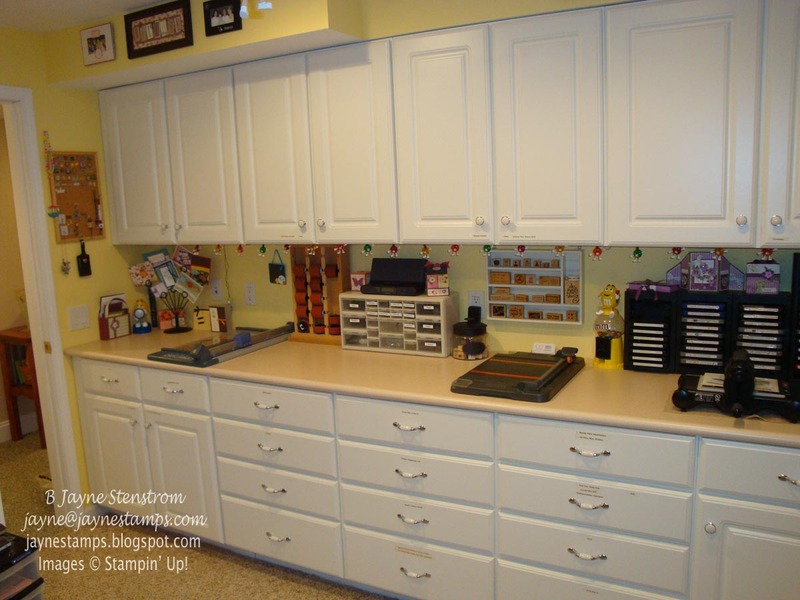 I hope you enjoyed my little tour through my stamping space. And for those of you who are demonstrators, now you know why I didn't enter Shelli's contest for a stamp room makeover. I also have some button ideas for you. This was a great display at Convention. 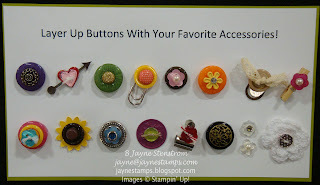 Have you ever seen so many ways to use our buttons, brads, and other accessories? I love all of these wonderful ideas! And here's a little mini card. 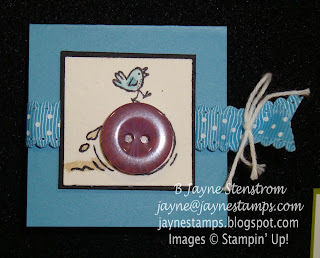 It looks like the bird is running on the button and making it spin, but the image is actually a snowball from the stamp set Snow Much Fun. By putting the button on top of the snowball, it makes this card something that could be used for any occasion! Don't forget about August's special - purchase 3 packages of DSP and get 1 FREE!! And while you're at it, you should probably pick up some coordinating buttons because you KNOW you're going to want to use them! This is amazing Jayne! Beautiful. 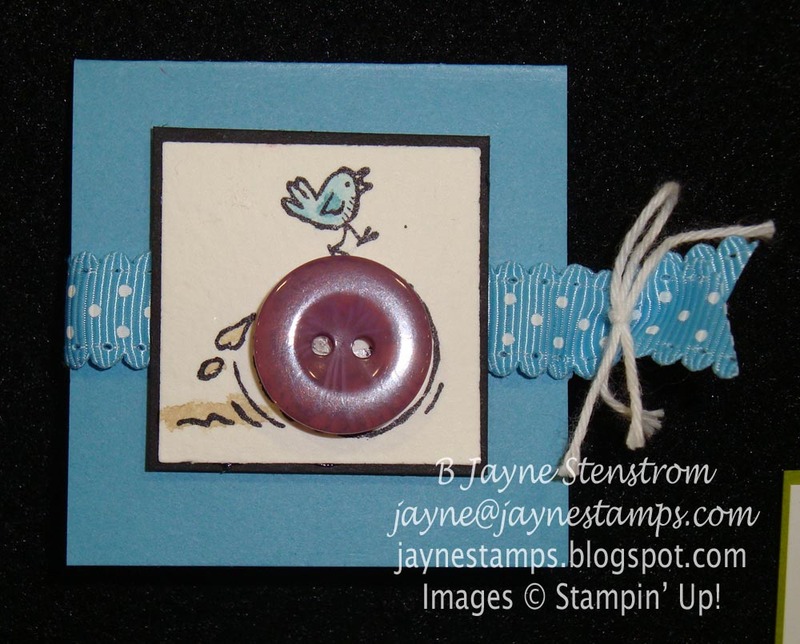 Have fun stamping and thanks for sharing!!!! Fabulous stamping space Jayne! I love it.